Louise Alder has very much a Sophie voice, a lyric soprano notable for its firmness of line, brightness and fluidity. In her introduction to the CD she talks about how she discovered Strauss's songs, via Elisabeth Schwarzkopf's recordings, at the age of 16 and that she jumped at the chance to record his songs for her debut disc. She sings with bright, forward tone and a lovely vibrant quality. This is combined with a deep feeling for the words so the songs really leap out at you. The songs are not recorded chronologically but thematically making a satisfying progress from Youth: Das Mädchen, through Longing: Sehnsucht, Passions: Leidenschaft, Partnership: Liebe and Motherhood: Mutterschaft to Loss: Verlust and Release: Befreiung. Throughout the songs I was impressed how Alder constantly combined the many lyrical beauties of her voice with vivid characterisation. words are always to the fore, as is a feeling for character and the distinctive tint of each song. Wisely she avoids the ones needing a more refulgent tone. There will be time to record those later. And what we get is an intelligent Sophie's-eye view of the songs. That is not to say that the performances are cool, songs like Wie sollten wir geheim sie halten are full of vibrant energy whilst there is quiet rapture in Das Rosenband and Die Nacht. And Strauss's more complex vocal lines, such as Muttertänderlei are given with an admirable sense of east. But it is the words that I come back to, the sense of great engagement which however never compromises the musical qualities of Alder's line. Joseph Middleton is a superb partner bringing out the richness of Strauss's piano writing, and aptly complementing Alder. Strauss's accompaniments are very orchestral and Middleton really does explore their full range of colours and textures. Rather frustratingly, there are no song texts, neither does Orchid Classics seem to offer them on line. Whilst Joanna Wyld's excellent booklet note gives details of dates and opus numbers for each song, the track listing does not which is again rather frustrating. 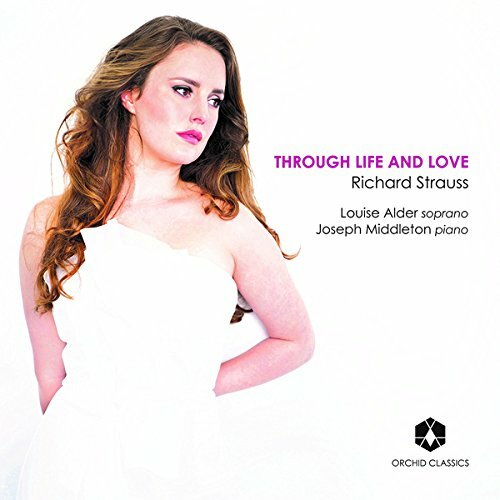 I do hope that Louise Alder records more Strauss songs, but this recital makes an enchanting beginning. Available from Amazon (from 30 June 2017).